At last, there's a nutrition and fitnessprogram that doesn't require you todevelop superhuman willpower, shunentire food groups, or devote yourevery waking moment to the treadmill. Harnessingthe powers of sleep, supplements, water, andstress management, all in perfect sync to optimizeyour body's performance. 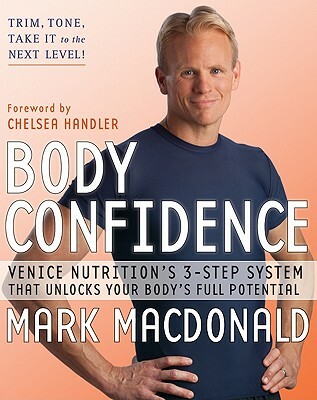 Body Confidence creator Mark Macdonald knowsthat weight loss doesn't happen in a vacuum, andhe has made room for "real life" at every stage ofthis program. Along the way, you'll be introducedto some of Venice Nutrition's extraordinary successstories, and learn how to stay on track no matterwhat life throws at you. Packed with recipes, nutrition guides, exercise journals, andVenice Nutrition's proven goal-setting tools, Body Confidence walks you through everystep of a process that has already changedthousands of lives. Getting in shape (and staying in shape) nolonger has to mean feeling deprived andhungry, living with low energy, being irritableand anxious, or obsessing about food andexercise. There is a way to make looking andfeeling your best a permanent way of life.